Wow Wee. They Read Three. Eeeeeeeeeeeee! 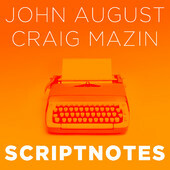 So happy that John August and Craig Mazin reviewed my three page challenge for the Scriptnotes Podcast (review starts at 42:19). When I heard it was going to happen I tapped, I paced, I boogied down. I was so excited my mom told me I was making her nervous. They reviewed the first three pages of my screenplay Bass Reeves: Lawman. Outlaw. based on the true story of Bass Reeves. And yep, Bass is pronounced like the fish. And yes, I’m actively looking for a better title. Very happy with their notes. That they got the action pleased me because it’s something I’ve struggled with in screenplays. It amazed me how many things I just couldn’t see anymore. The Fade In was there from a previous draft were I had a short voice over against a black screen before the visuals. I never caught that I started the rain before I started the rain (neither did the other people I’ve had read it.) It’s odd how you can get so you can’t really see things anymore. Like any writer, I was disappointed that it wasn’t perfect. The thing that got me the most is what they said about those last three lines. I fought to get the last two lines within the three pages. Finally resorting to erasing the super of Spring 1876 and adding it to the slug line. I was so proud of this last part. I thought they were going to think it was so clever and funny. I knew it was going to be the highlight of the sample. But this is what they hated the most. When Craig said that these guys had just killed and escape being killed I realized what a horrible mistake I had made. I forgot to make sure these characters where real, with real thoughts and emotions. Instead, I went for what I thought was cute. In fact, both times in these pages that I went for what I thought was good writing instead of a record of real people I messed up. That second line in which John pointed out the many faults and Craig called Yoda writing I had fallen in love with the words and my fabulous imagery. Maybe my struggles all these years to move away from prose writing to screenwriting is just as simple as it’s not about the words, it’s about the characters. We hear it all the time, a screenplay is only a blueprint. The words are not the final product. Now I understand what that means for me. That revelation is not the only thing I’ll take away though. Craig Mazin said I can do this and John August said I’m a talented writer. The warm fuzzy feelings those words give me is something to cherish and hold onto for the rest of my life. UPDATE: My revised first three pages for that version of the script that was reviewed on the podcast can be viewed here. However, this scene is no longer in the script. I rewrote the entire first act and changed the title. Read the entire script of The Black King on my Screenplays page.